Feedback: Tim, Jeremy and special guest Michael Dymond (Stormknight) tackle the second batch of voicemails, and it’s 100% Neil from Bowie, because that’s how we have to handle it whenever he gets on a roll. Are there official blueprints and cutaways for Babylon 5? 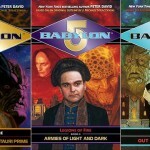 Deep Geeking: This week, both Gary from Jacksonville and Neil from Bowie join Summer and Jeremy to discuss the initial 11-issue run of Babylon 5 comics, published originally by DC Comics, and later collected into graphic novel collections by Titan Books and by DC. Discussion: Tim, Summer, Jeremy and guest Gary from Jacksonville discuss the plan for talking about the Babylon 5 comics published by DC Comics and by Titan Books. Many issues surrounded the actual creation, writing and publication of the series, and Gary gives us a little bit of that wacky history. Tim and Summer are joined by The Jason Davis to talk about the adventure that was the records excavation that became the new volume “Artifacts from Beyond the Rim”. Deep Geeking: The year we really did finally make it to Crusade. Going by the revised broadcast order, our first Crusade episode to geek on is “Racing the Night”, and Jason joins us for the analysis. Tim, Bret and Gary dive into the first batch of voicemails discussing the “Babylon 5 Topics” series, addressing listener perspectives and opinions on those very topics, and theories we didn’t fully discuss. Discussion: Tim, Summer and Bret continue the discussion about alternate story possibilities within the original 5-year arc.